I have the Kindle app for reading on my ipod touch and I absolutely love it. I hate the default settings, but I love the app. It's the app that I use the most on my ipod touch, which is saying something. I have all sorts of games and entertainment on my ipod touch and yet most of my time is spent reading on it. The Kindle app links to your Amazon.com account which allows for easy purchasing of digital books. Most of the books are cheaper in digital form than they are in paperback. I found one of my favorite trilogies for $9.99 which is the cost of one of them in paperback. Not only that, but I've found that a lot of authors have free digital copies of the first book in a series in an attempt to get new readers. 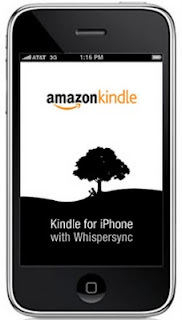 Any book available in the Amazon Kindle store can be tried for free. There is a buy button and a sample button. The sample will download the first portion of the book to the application for free. It's like browsing new books in the bookstore. The Kindle app allows bookmarks, font size adjustments, font color adjustments, jumping to any point in a book, and Whispersync. Whispersync is really cool. It keeps track of where I am in every book I read so that when I access my digital books on another device - like a computer, blackberry, or Kindle - I am at the same spot in the book. My two favorite things about the Kindle app are that I can read in the dark and I can read on the go without hauling a book along. Paperbacks aren't that big, but an ipod touch or iphone is smaller and can contain an entire library of books. I use my ipod touch to read in the dark almost every night. If the Kindle itself was backlit I might buy one, but until then I'll keep using my ipod touch because of its backlight. Now for the default settings I mentioned, it's time to change them! Go into a book. Tilt your ipod on its side to make the app go into landscape display mode then tap the bottom right corner of the screen to lock it that way. Now it won't move around when you shift or change positions. Next, tap the middle of the screen to bring up the options menu. Tap the little aA icon - for font - and change the text color to white (which shifts the background to black). It may look strange at first, but I just saved you from headaches and eye strain. I regularly read in the dark with my ipod touch since it's backlit, but I wouldn't be able to if my font color was set to black. I tried the first week I had it and got some massive headaches. Keep your font color on white, it works great! I can't recommend this app enough! If you have an iphone or ipod touch and have a love of reading you really need to get the Kindle app.